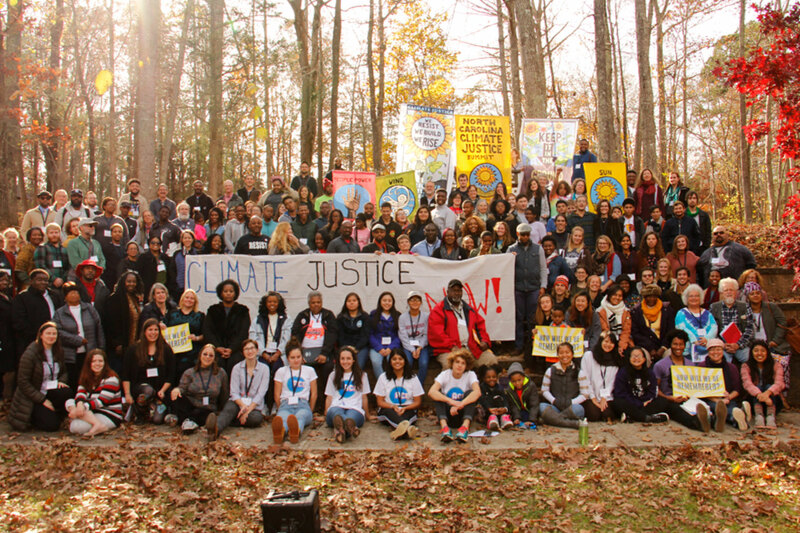 This year’s fifth NC Climate Justice Summit–March 1st-3rd at the Haw River State Park–brought together a highly diverse group of people to put our strengths of head, hand and heart toward creating a vibrant future for all! The Summit, like all the work of the NC Climate Justice Collective, centered the leadership of youth, indigenous peoples, people of color and frontline community members. We root our work in a cultural strategy that weaves together the 4 Rs of social transformation—Reform, Resist, Re-imagine and Re-Create. This year’s Summit was based on our interactive performance, The Good Fire, which offers a metaphor for practices of energy justice, community resilience, and collective liberation. Workshop tracks featured skills building in each of the 4 Rs, as well as caucus-based discussions. We continued to align frontline struggles against fracked gas pipelines, coal ash pollution, biogas from factory farms and biomass from deforestation. Participating organizations showcased their work during the campaign fair. And of course, people broght something to share during the epic open mic night! We found new sparks of inspiration and the warmth of authentic connection. In 2016, Hurricane Matthew caused massive damages and flooding in the eastern part of our state, displacing many families–our first self-described climate refugees–and further polluting the communities where toxic coal ash and hog waste overflowed their meager enclosures. In 2017, Hurricanes Harvey and Maria devastated communities elsewhere, but we felt their pain and understood the injustice at the root of these vicious storms. As we continue to deal with the aftermath of more unprecedented storms–Hurricanes Florence and Michael–that have ravaged our own region, we struggle to ensure that those who are always first and worst impacted are not forsaken. We know that only a Just Transition to a clean energy economy can turn the tides of destruction and source thriving, equitable, earth-honoring, joyfully inclusive communities. Until we achieve that, the next unnatural storm will always be bearing down on us. 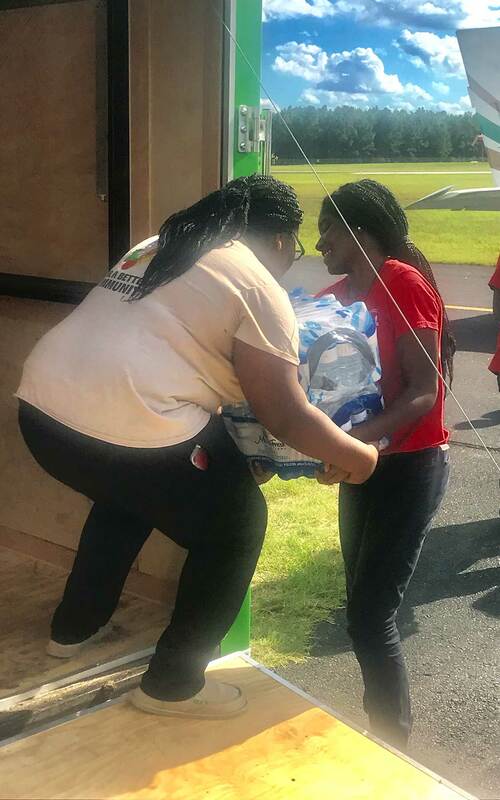 Directly donate to the North Carolina Climate Justice Collective to support their work on the ground with their frontline community members in eastern NC. Donate today! Write “NC Climate Justice Collective” or “NCCJC” in the memo line. *NC WARN is the fiscal sponsor for NCCJC and is a 501c3 organization. All donations are tax-deductible and you will receive recognition of your gift from NC WARN noting our tax ID. To get the most up to date information on what we are doing in North Carolina and how you can help, check us out on social media and share our most recent appeals and posts on facebook (@ncclimatejustice) and twitter (@NCClim8Justice). We ask that you support a Just Recovery from Hurricane Florence by connecting to frontline organizations working in NC at the intersection of economic, racial and ecological justice. Go to justflorencerecovery.org to learn more. The NC Climate Justice Collective uses popular education and cultural organizing to align our frontlines and address the root causes of climate change. We link local, regional and statewide efforts–and build across differences of identity and strategy–to grow our movement ecosystem and strengthen impacted communities.